A fortnight ago, I outlined what the OpenAustralia Foundation team has been up to, in helping land Australia’s First Open Government National Action Plan (NAP). In December 2016, Prime Minister and Cabinet’s office announced Australia’s first National Action Plan (the Plan, or NAP) complete with 15 reform commitments. To help make sure we give Australia’s Open Government reform commitments the best chance of success, that they retain their ambition, are relevant and are successfully rolled out, it’s vital that civil society stay closely involved. I’ll continue to work with the Interim Working Group and Australian Open Government Partnership Civil Society Network Steering Committee (at least until the transition & election respectively, and if selected/elected, beyond that), to help both groups evolve. The current Interim Working Group was appointed by the Federal Government last year. This group now has to perform a couple of big infrastructure ‘build the plane as we’re flying it’ maneuvers, in true OGP spirit the IWG has to Establish a way for Government, civil society and non-government stakeholders to meet regularly and work together effectively. This is the focus of reform commitment 5.1, designing a multistakeholder forum that has the agency and capacity to oversee the National Action Plan. The due date on creating that forum is the end of March, less than a week away. Our current working group doesn’t meet again until the end of March. 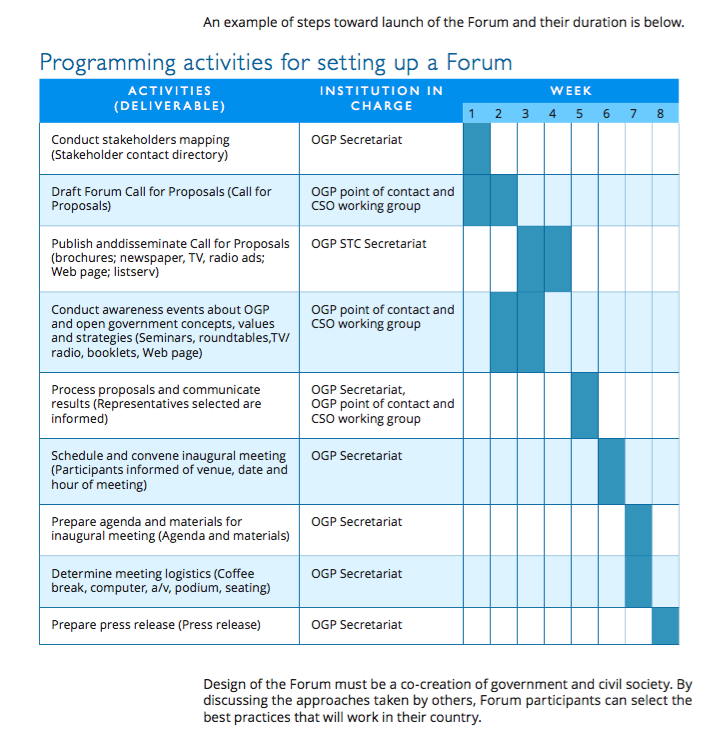 The OGP Multistakeholder Forum handbook outlines an example (and quite ambitious) timeline, setting out activities for developing a forum is 8 weeks. So even if we kicked off at that next meeting and used this template, we’d still looking at June completion at the earliest. The Interim Working Group remains responsible for overseeing 15 Open Government reforms. There are also important roles for Civil Society Organisations and other non-government actors to play here. The IWG will help ensure that government agencies leading each of the commitments identify these groups. Charities, smaller Non Government Organisations, grassroots, and informal community groups, all have enormous experience and deep insights into problems that this National Action Plan seeks to solve. Successful partnership between civil society and government is essential to the OGP’s platform for action. Work with Department of Industry and Innovation on Commitment 5.2 Beginning the next steps with a meeting between Department of Industry and Innovation representatives, Peter Timmins and me last week. There are a bunch of commitments that are closely connected with the work that the OpenAustralia Foundation do, in opening up government. We’ve previously written about, gathered data, and provided evidence on issues that are part of this reform agenda. Also, as part of this Open Government National Action Plan, we’ve drafted, contributed to, commented on, solicited and provided feedback for commitments that form our National Action Plan. We’re also a tiny team. We have to focus our work on where we can be most helpful and effective. As luck would have it, the timing of our next planning meeting couldn’t be better, it’s on Monday. We’ll review this work then. We’ll look at our objectives, how we can best connect with Australia’s involvement in the OGP along side all our other work. I expect to report back here next week both from OAFs’s planning meeting on Monday, and that I’ll have good progress to report from the Interim Working Group’s next meeting on Tuesday. If you’re in Sydney on Tuesday, consider coming along to our next pub meetup. The steering committee for the Australian Open Government Partnership Civil Society Network (aka. AOGPN or the Network) was brought together quickly. This pragmatic and cooperative group adapted the UK network’s open model & resources to establish the Network quickly. Now the first National Action Plan is underway, there’s little time to regroup, to reflect and to evolve. Initially formed in November 2015, the steering committee committed to hold elections within 18 months of forming the network. Attract and elect a new steering committee. The Network is now actively looking for strong Civil Society leaders to nominate for the Steering committee to come forward. Nominations due in by end of March. I’ve put my hand up. Clarify identity – what do we mean by Civil Society? Figure out where the network stands on what constitutes a member of ‘civil society’ that the group agrees to work with. How do business people fit into this model? Increase diversity of members to better reflect the diversity of our communities in Australia. As a representative of this lead Civil Society organisation, I’ve been asked to assess OGP NAP work to date this week. I’ll pull the final report together with colleagues from the Network steering committee tomorrow, and then present this initial review through involve.org.uk’s Civil Society review tool. One of the strengths of the Open Government Partnership is the Independent Reporting Mechanism, and while the Civil Society review isn’t part of that formal review, its great to have an opportunity to provide early feedback, and opportunities to apply some corrections as we get into the implementation phase. Down the track, this parallel report might also be taken into consideration by Australia’s independent OGP reviewer. “Independent monitoring Provides input on the government self-assessment report and the Independent Reporting Mechanism research process; work with civil society partners to comment on these reports and/or prepare a parallel, independent assessment of the OGP”. Find out more about civil society engagement on the OGP’s website. Here’s looking ahead then to an elected (and refreshed) steering committee for the Network. By mid-Winter Australia the IWG might even hope to establish the first iteration of a Open Government multistakeholder forum, driving this Open Government agenda, collaboratively, full speed ahead. This entry was posted in Open Government Partnership, OpenAustralia Foundation, Planning. Bookmark the permalink. Post a comment or leave a trackback: Trackback URL.